The inaugural Clean Energy Financing Advisory Council (CEFAC) gathering in San Diego was a successful launch of the 12-part series of events and webinars scheduled for 2016. Energy contractors, representatives of financial institutions, utilities, local government staff, real estate professionals and consultants joined together to learn about valuable information and resources and enjoy lively networking. Energy Upgrade California’s® mascot Bear made an appearance to salute the audience’s contributions toward saving energy and other resources. 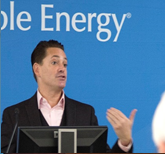 Campbell gave an overview of the supply and demand for energy efficiency financing products including the lending volume to date, characteristics of each product, contractor’s support and perspective on financing, and the customer demand for energy-related upgrades and financing. 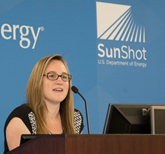 She manages the statewide impact evaluation of California’s first ratepayer-funded energy efficiency financing programs and recently completed a baseline market characterization of the California residential energy efficiency financing market. The CA Residential Financing Baseline Market Study is now publicly available at: http://www.energydataweb.com under the titles, “PY 2014 FINANCE RESIDENTIAL MARKET BASELINE STUDY REPORT VOLUME I”, and “PY 2014 FINANCE RESIDENTIAL MARKET BASELINE STUDY REPORT VOLUME II”. Cohen covered the tools and resources recently launched on the Go Green Financing website, along with an introduction to the “State of Saving” campaign. He is currently managing the implementation of statewide financial initiatives designed to increase the uptake of financing for energy efficiency and demand response projects in the single-family residential, multifamily, small business and medium-to-large nonresidential sectors. Utilize strategic partners (contractors, IOU’s, FI’s, Regional Energy Networks, Real Estate professionals, and other stakeholders) to spread the message and engage audiences. Want to learn more about clean energy financing opportunities for your local government?